Ahhh, the holiday parties have passed but don’t look now…NFL playoffs are starting and tailgate parties are popping up. 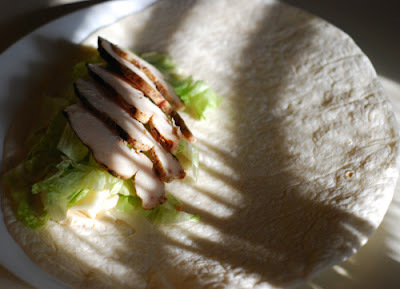 I know, chicken wraps can seem a little boring, but not these. These wraps are packed with the bold flavors of Carribean jerk seasoning and are great portable “party food”. Marinade the chicken according to the marinade directions. You can use a commercial brand, Walkerswood is a popular brand but I’ve never tried it. I prefer to make my own with a blend of dry seasonings, onions, chilies, and liquids (recipe here). Mix the mayo ingredients together and refrigerate for at least 1 hour before serving. Preheat a charcoal grill to medium heat (350f). 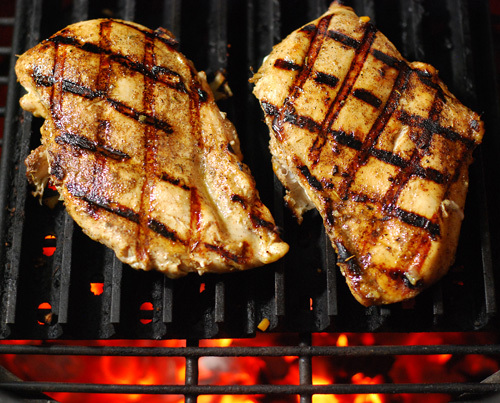 Grill 8-10 minutes a side or until the chicken breasts reach an internal temperature of 160f. Let chicken rest for 15 minutes before slicing as thin as you can across the grain. On each tortilla, smear 1 tablespoon of the spicy mayo to one side. Top with two slices of cheese, a handful of lettuce, and several slices of chicken. Fold the top of the tortilla down, the bottom up and roll up burrito style. You can cook the chicken a day in advance. 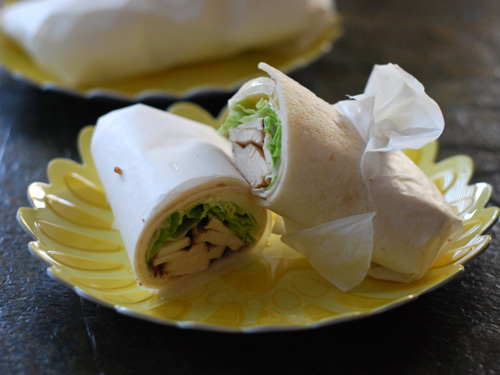 These wraps are delicious served hot or cold. I use a lower grill temp for chicken because I don’t want the savory marinade ingredients to burn. But if you like to grill at high temps and 4-6 minutes a side, knock yourself out. Also makes a tray of 20 appetizer servings. I like to wrap ours in deli paper before slicing, it holds them together better if making a tray of them. Jerk usually uses bone in chicken but tastes great on boneless chicken too! Place to the side like this, fold top down, bottom up and roll left to right. 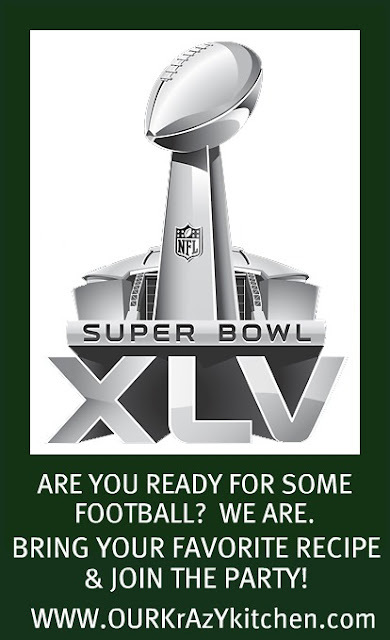 IT’S ALMOST TIME – THE SUPERBOWL IS FEBRUARY 6TH! BRING YOUR FAVORITE RECIPES AND JOIN US ON FEBRUARY 6TH FOR A VIRTUAL TAILGATING PARTY! WHO ARE YOU ROOTING FOR? 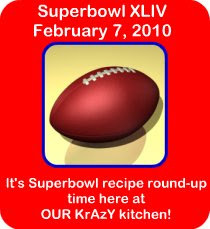 Don’t forget we’re having a Super Bowl party at OUR kRaZy Kitchen tomorrow. Stop on by, link up and see what everyone else is serving. I can’t believe Superbowl is less than 2 weeks away! We’re having a SUPERBOWL party over at Our KrAzY kitchen and I thought I would whet your appetites with a few of our favorite appetizers and dips. Heat broiler. Combine mayonnaise, garlic and lemon juice. 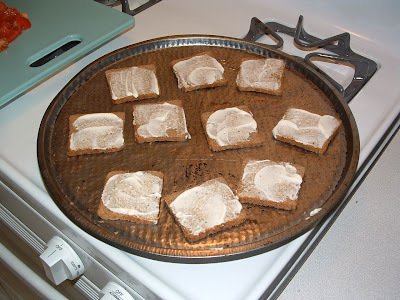 Arrange bread slices in a single layer on a cookie sheet. Place under broiler for 1 minute to toast bread slices. Turn bread slices over and spread with mayonaise mixture. Top with cheese. Broil 1 minute until cheese begins to melt. Top with torn romaine, crumbled bacon and tomato pieces. 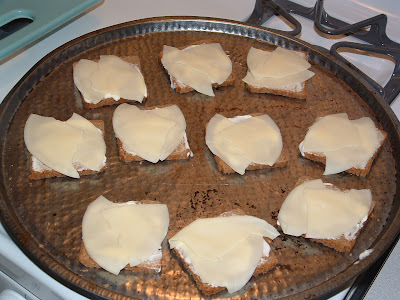 Arrange bread slices in a single layer on a cookie sheet. Place under broiler for 1 minute to toast bread slices. Turn bread slices over and spread 1000 Island dressing over each slice. Mix coleslaw and horseradish together. Top with coleslaw, corned beef and cheese. Broil 1 minute until cheese begins to melt. Drizzle with remaining 1000 Island dressing. Preheat oven to 400 degrees. Combine cream cheese and sour cream until smooth. Fold in cheese, bacon and green onions. Bake 25-30 minutes. Serve with sourdough bread pieces. Mix everything together well. Spread about 3-4 tablespoons of mixture onto each tortilla leaving a 1/2 inch on one edge. Roll up ending on the edge without mixture spread on it. Lay sides by side, cover loosely with plastic and chill overnight. 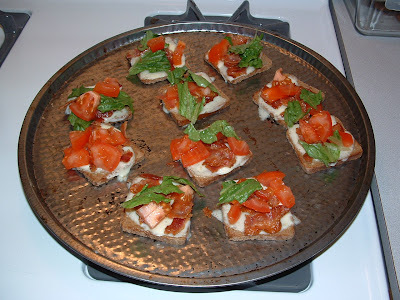 Cut into 1/2″-3/4″ rounds just before serving. My niece also adds 2 ounces chopped black olives to the mixture. In a small mixing bowl beat cream cheese smooth. Add bleu cheese until smooth. Add hot sauce. Fold in chicken pieces. Microwave until heated through (about 2 minutes). Serve with celery sticks and white corn tortilla chips. In a small mixing bowl beat cream cheese smooth. Add in Cheez Whiz, ranch dressing mix, garlic powder and pepper until smooth. Fold in beer. Serve with carrots, celery, broccoli and white corn tortilla chips. Puree the cream cheese, mayonnaise and cheddar cheese. Add garlic, red pepper sauce and 1/2 red peppers. Puree again. Fold in remaining red peppers. * Serve with carrots, celery sticks, snap peas and white corn tortilla chips. *If you prefer a smoother dip, puree all the red peppers. In a small mixing bowl beat the cream cheese smooth. Add the sour cream, dip mix, garlic powder and paprika. Fold in Parmesan cheese, green onions and artichoke hearts. Chill for several hours or overnight. Serve with assorted vegetables and chips. In a small mixing bowl beat the cream cheese smooth, add the refried beans and beat until smooth. Add the salsa, taco seasoning and red pepper puree. Heat in microwave 2-3 minutes. Serve with white corn tortilla chips. Preheat oven to 350 degrees. In a small mixing bowl beat the cream cheese smooth. Add the ricotta cheese and blend until smooth. In a small food processor pulse broccoli pieces, lemon juice and cannelini beans until smooth. Add to the cheese mixture and blend well. Transfer to a 1 quart baking dish. Bake 30 minutes until bubbling. Serve with various vegetables and chips or crackers. I’m seeing an ad for PHILADELPHIA CREAM CHEESE here! I use PHILLY cream cheese exclusively. Brown beef and onions until browned. Drain well. Return meat mixture to pan. Stir refried beans and sour cream together until smooth. I find that heating the beans in the microwave for a minute or so softens them enough to stir well. Add bean mixture, tomato pesto and RO-TEL tomatoes to the meat mixture and simmer until thick. Add 1/2 cheese and stir until melted. Top with remaining cheese. Serve warm with tortilla chips. Brown ground beef, sausage and onion together. Drain off fat. In a slow cooker combine all the ingredients. Cover and cook on low for 2 hours. Blend cheese in well. Serve with tortilla chips. It doesn’t matter who you were rooting for, you CAN’T, I repeat CAN’T watch the SUPER BOWL unless you have hot wings and buffalo cheese dip! Personally I’m so glad the Giants won. What more could you ask for but to have back to back years with boy next door American quarterbacks (brothers no less). These two give the whole sports image icon a super boost. I’d rather have my kids looking up to either Eli or Payton Manning over say Michael Vick. It just oozes, American flag, fireworks, Chevy, hot dogs and apple pie. Oh and mom was there too! Hosted by Overwhelmed with JOY. What’s the SUPER BOWL without HOT WINGS and home made BLEU CHEESE dressing for dipping along with a good beer and few dozen other appetizers? Now I try to watch our fats and prepare balanced meals on a day to day basis, but let’s get real here people, this is the SUPER BOWL ~ it’s like Christmas or Thanksgiving. Do you even think twice on those days before you pop, well let’s be honest you’ll pop ANYTHING that looks good into your mouth on those days? Of course not, so why think about it today? Plus here’s the bonus, they’re technically baked so there good for you, right? 2-3 dozen+ chicken wings ~ We prefer drumettes (with a little meat on them) to actual wings, but it’s your choice. Today I used what was in the freezer for picture sake, but next week it’ll be drumettes for sure! I also prefer to use an old cast iron frying pan (our is at least 3rd generation, dating back to hubby’s grandfather that we know for sure). I still believe this gives you the most even browning. Wash and dry the chicken pieces. Mix together the flour and seasonings in a plastic ziploc bag. Using a ziploc bag makes it easy to throw away the whole mess after dredging all the chicken pieces and it helps you coat every possible spot of the chicken pieces. Add chicken a few pieces at a time and coat them well. Set chicken pieces aside. While you’re doing this, have the butter melting in the pan. Start with 1 stick and add as necessary, but make sure you don’t run out dry. Once all the chicken has been dredged start frying. After you have the pan full pepper the pieces again. Don’t turn the chicken until you can see blood. You only need to turn the chicken one time. 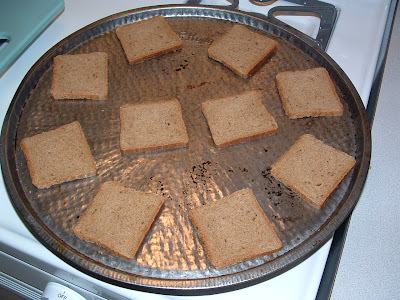 Brown evenly and then set aside on paper towels until all pieces have been fried. As the last batch is frying melt the other stick of butter in a 4 cup measure cup. To that add 1 cup of Frank’s hot sauce per stick of butter. Whisk them together well. Spray a cookie sheet with PURE. Dip each piece of chicken into the hot sauce mixture and put on cookie sheet. After you’re all done and if you have hot sauce & butter mixture left, pour a little over the top of each wing. Serve hot with my homemade Bleu cheese dressing and celery sticks if you’d like. I put it all in my food processor and pulse until it’s well mixed. Chill for 24-48 hours before serving. CLICK ON PICTURE TO ENLARGE FOR MOUTH WATERING VIEW.